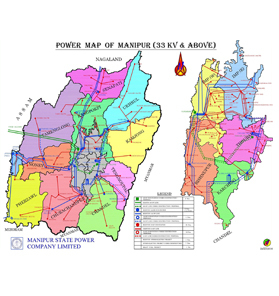 Erstwhile Electricity Department, Government of Manipur was unbundled into two state owned companies namely, Manipur State Power Company Ltd. (MSPCL), & Manipur State Power Distribution Company Ltd. (MSPDCL) with effect 1st February 2014 as per Manipur state Electricity Reforms Transfer Scheme 2013, as mandated in Electricity Act 2003. Manipur State Power Company Ltd. (MSPCL) as a deemed transmission licensee for the State of Manipur will undertake the function of transmission of electricity and also discharge all functions of the State Transmission Utility (STU). Further, MSPCL will act as the Holding Company for the State Government’s investments in Power Sector and will undertake overall co-ordination & planning for the power sector in the State of Manipur, be the authorized representative of the State Government for development of hydroelectric power potential in the State of Manipur and perform such other functions as may be entrusted to it by State Government from time to time.